GEORGE TOWN: Ivory Properties Group Bhd is expecting approval from the Penang Development Corporation (PDC) this week for its proposed RM10 billion “Penang World City” project at Bayan Mutiara. Executive director Murly Manokharan said yesterday the development was expected to incorporate, among others, medical facilities, Grade-A offices and both high-end and affordable housing units. “We are open to working with strategic partners for certain components of the development, such as a shopping mall and a medical centre, as opposed to seeking investors for an outright sale of chunks of the land,” he told Business Times after the company’s extraordinary general meeting (EGM). Present was Ivory’s deputy chairman and executive director Datuk Seri Nazir Ariff Mushir Ariff. During the EGM, which lasted 40 minutes and saw a shareholder turnout of 62 per cent, the company received unanimous approval from those present for its plan to purchase and develop a 41.02ha site in Bayan Mutiara on Penang island, from the PDC and Chief Minister of Penang (Incorporated). The land was sold for RM1.07 billion, or RM240 per sq ft, to be paid over five years. Shareholders also gave their nod for a joint-venture between Ivory and Dijaya Corporation Bhd to develop the land, which is located near the Penang Bridge. After the execution of the Builder Agreement, Tropicana Ivory Sdn Bhd – which is 55-per cent owned by Dijaya and 45 per cent by Ivory – will develop the RM10-billion Penang World City development. The development will be a mixed-use residential and commercial project. Murly said the master-planned development, which has been crafted by international firm Design 103 International Ltd, would adhere to any height restrictions imposed by the Department of Civil Aviation, owing to the project’s proximity to the Penang International Airport at Bayan Lepas. Any project sited within 15km from the airport is deemed by the DCA to be in the flight path. Penang World City, he noted, was expected to be completed in eight years, with work on the first phase commencing at the end of this year. “Now that we have obtained shareholder approval to enter into the joint-venture with Dijaya and also for the proposed rights issue, we are looking at a RM500 million capitalisation and are in a better financial position to carry out the project,” Murly said. As the principal builder of the project and turnkey contractor, Ivory will manage and develop the entire project, for which it will be entitled for 48 per cent of the gross development value. “We are currently engaging with both local and foreign investors who may been keen to partner us in certain phases of the proposed development. “However, our first obligation is to honour whatever outstanding payments which are being owed and we are looking at settling the RM80 million being owed to the PDC by April 10,” Murly added. PDC and Chief Minister Inc sealed a deal on November 11 last year to sell the land to Penang-based Ivory Properties Group Bhd for RM1.07 billion, or RM240 per sq ft, to be paid up in five years. 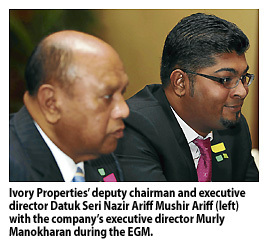 Ivory’s chairman and group chief executive officer Datuk Low Eng Hock was quoted last month saying that the company has paid a RM22.1 million deposit for the land and that the remainder will be paid according to the scheduled progress payment after shareholder approval was obtained at the EGM.